It's time for the first WIPocalypse update of the year! WIPocalypse projects are all of those works in progress that we hope to finish before the world ends. I only worked on a few projects this month, but I made good progress. First up ... 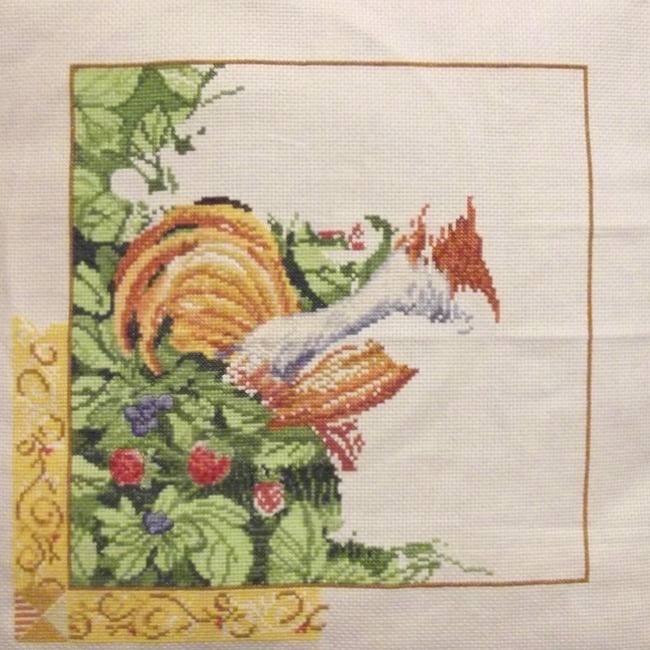 I have completed January's motif for the Linen and Threads 2019 Mystery Sampler (shown above). I have named my peacock, "Georgie". I can't wait to see what's in store for February. I stitched a head for my "Berry Patch Rooster" (finally), and filled in sections here and there. 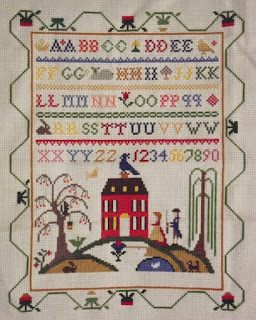 I also put in quite a bit of time on "American Sampler" by Sandra Sullivan. 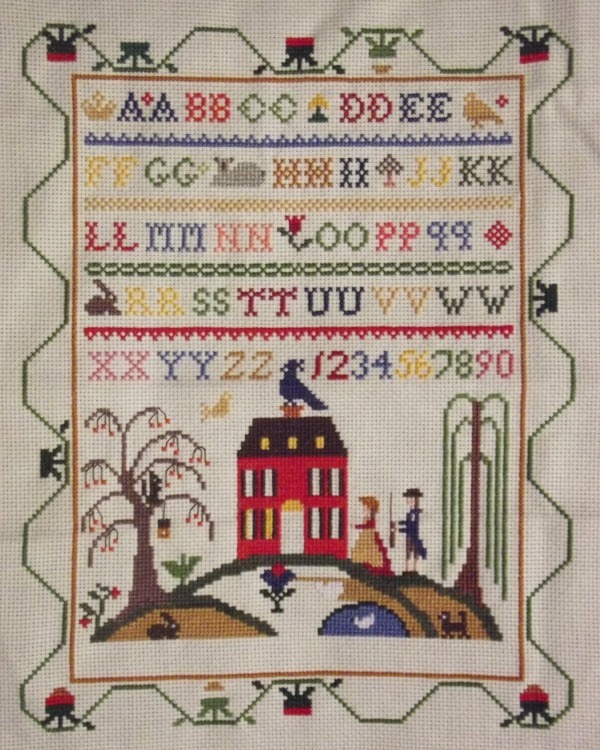 I added another tree, the Colonial couple, a flower, and worked on the border. I am keeping this project handy, as I would like to finish it up. What SALs are you participating in this year? That's all for this update. I hope to make even more progress next time. I just adore that rooster! He’s quite fabulous! Georgie looks great on that fabric! 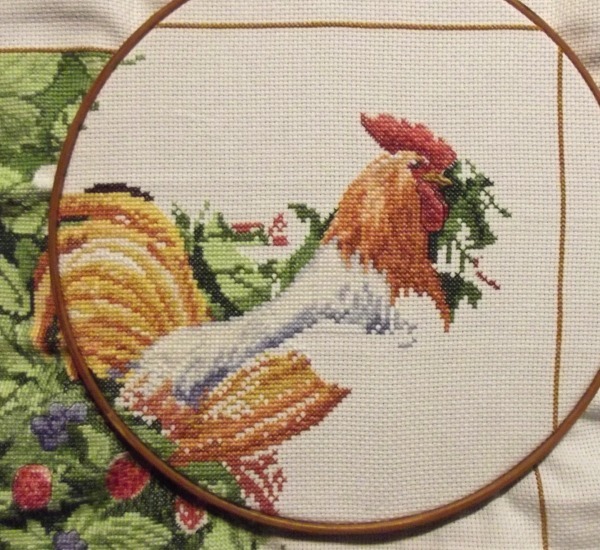 Your Rooster is coming along nicely too. That will be a fun sampler with the changes you have in mind. Love your peacock on that gorgeous fabric. I'm intrigued by the way you are planning to age the sampler too.